As you read this sentence, trillions of invisible particles called neutrinos are streaming harmlessly through your body. These ghostly particles are produced in the core of the sun and other stars, where they stream away at nearly the speed of light. Their ability to pass through solid matter makes neutrinos very difficult to detect, yet we know they exist. How is this possible? And why are neutrinos able to pass through solid matter? Neutrinos are merely one of the several dozen subatomic particles that exist in nature.1,2 Since God is a rational Being and has imposed order on creation,3 physicists can classify particles by their properties in a hierarchy much the same way biologists classify living organisms. Just as a cat is a mammal, a vertebrate, and an animal, so a proton is a baryon, a hadron, and a fermion. In this series of four articles, we will examine the various families of subatomic particles, their interesting behaviors, how they are classified, and how they often confound secular thinking. We begin our journey with something familiar: the atom. In school, students are taught that atoms are the basic building blocks of matter, comprising everything we can touch. But atoms are composite particles, meaning they are made of even smaller particles. An atom consists of a central positively charged nucleus surrounded by one or more electrons, which have a negative electrical charge (Figure 1). The nucleus is made of positively charged protons and neutral neutrons. The number of protons determines the type of atom. Since opposite electrical charges attract, electrons orbit the nucleus, much as planets orbit the sun. But there are some differences. First, planets orbit the sun because of the force of gravity, whereas electrons orbit due to the force of electromagnetism. Second, given the right speed, a planet can orbit at virtually any distance from the sun. But electrons can only orbit at certain specified distances from the nucleus. 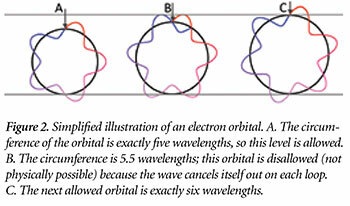 These special distances are called orbitals. In physics, when only certain values are allowed (i.e., physically possible), like the orbitals of an atom, the system is said to be quantized. This is where we get the term quantum physics. Almost all the mass of an atom is contained in its nucleus. This is because protons and neutrons are each over 1,800 times more massive than an electron. 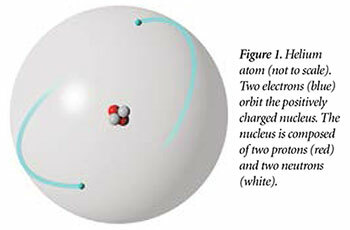 The nucleus of an atom is unimaginably small, even when compared to the size of an atom. Consider a hydrogen atom. Its diameter is roughly 1.06 × 10-10 meters; that is one ten-millionth of a millimeter. The nucleus of the hydrogen atom—a single proton—is more than 10,000 times smaller! The implication is hard to imagine but quite clear: Atoms are mostly empty space. Three of the six leptons—the electron, the muon, and the tau (or tauon)—have an electrical charge of negative one (-1).6 Of these, the electron (represented by the symbol e– or β–) is the lightest, with a mass of only 9.109 × 10-31 kilograms. It is thought to be the least-massive charged particle. The electron is stable, meaning it will never spontaneously change into any other particle. The muon (µ–) is essentially identical to an electron except that it is 207 times more massive. Muons are unstable and will spontaneously decay into other particles. Typically, muons last only 2.2 microseconds before they decay. The tau particle (τ–) is the heaviest lepton, with a mass 3,477 times greater than that of an electron. Tau particles are very unstable and typically last only 2.9 × 10-13 seconds before they decay into other particles. Already we can see a general trend—heavier particles tend to be more unstable than the lighter particles of a given class. As for the other three leptons, we can think of them as neutral versions of the previous three. These neutral leptons are called neutrinos, represented by the lowercase Greek letter nu (ν). These are the ghostly sun-generated particles that can easily travel through solid matter. Each of the three types of neutrinos corresponds to its electrically charged brother. So there is an electron neutrino (νe), a muon neutrino (νµ), and a tau neutrino (ντ). All three are much lighter than the electron, and they are apparently stable.7 The exact masses of the three neutrinos are not yet known because they are so small and difficult to measure. 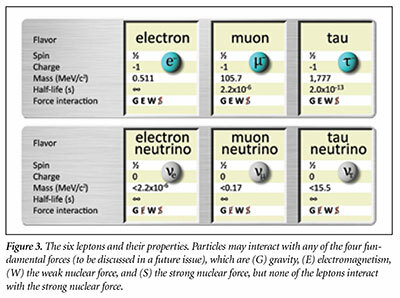 Figure 3 lists the six leptons and their properties. If neutrinos are merely neutral versions of electrons, muons, and tauons, then why are they so much less massive? There is a good reason for this. Albert Einstein showed that energy has mass. Electrons have some internal potential energy because of their charge. Therefore, a charged particle—whether it’s positive or negative—will always be more massive than an otherwise identical particle that lacks such a charge due to its internal potential energy. How can neutrinos pass right through ordinary matter? The answer involves the nature of the neutrino and the nature of ordinary matter. First, recall that atoms are mostly empty space. This is because the distance between the nucleus and any orbiting electrons is enormous compared to the size of the nucleus. Second, neutrinos are electrically neutral. So, they are neither attracted to nor repelled by the electrons or nucleus of an atom. The only way to stop a neutrino is if it essentially collides with the nucleus or electrons, but the chances of this are extremely remote. It would be like trying to hit a bullet in mid-air with another bullet from a mile away. So, neutrinos will of course pass through atoms since atoms are almost entirely empty space. A better question is this: Why doesn’t everything else pass directly through atoms? The answer is that many other particles are charged and therefore are influenced by (repelled by or attracted to) the electrons or nucleus of an atom even at some distance. This is why electrons or other atoms cannot pass through each other—they are mutually repelled by the negatively charged electron shell (the region in which electrons move). All fermions obey a rule called the Pauli Exclusion Principle. This principle states that no two identical fermions can occupy the same quantum state at the same time. Basically, this means they cannot be in the same place with the same energy, angular momentum, and spin states at the same time. This is why only two electrons are allowed in a given orbital sub-shell; one must be spin up (+1/2) and the other spin down (-1/2). Conversely, bosons do not obey the Pauli Exclusion Principle. We can put as many bosons into the same quantum state as current technology will allow. In addition to charge and spin, leptons also have a quantum value called lepton number.9 It is positive one (+1) for every lepton and zero (0) for non-leptons. Additionally, there are three lepton-family numbers—the electron number, muon number, and tau number—based on the type of lepton. The electron number is positive one (+1) for all electrons and electron neutrinos, and zero (0) otherwise. Likewise, muons and muon neutrinos have a muon number of one, and so on. These quantum numbers are important when we consider how particles decay. For every type of particle, there is an equal and opposite antiparticle. An antiparticle has the same mass as its corresponding particle, but other properties such as electrical charge and lepton number are reversed. Just as there are six leptons, there are six antileptons. As one example, the antimuon has the same mass as a muon but has a charge of +1, a lepton number of -1, and muon number of -1. Neutral antiparticles are represented by a bar over their symbol. So, an antielectron neutrino would be v–e. For charged particles, the bar is usually omitted since the sign of the charge makes it unnecessary; so, the antimuon would be µ+. Most antiparticles have the same name as their corresponding particle but with the prefix “anti.” The one exception is the antielectron, which is normally called a positron. In many cases, you can actually predict which particles are unstable and how they might decay. This is possible because particles obey conservation laws that require that certain quantities cannot be created or destroyed. Such laws are a consequence of the fact that God is no longer creating the universe (Genesis 2:2) but is upholding what He has made (Hebrews 1:3). For example, energy is a conserved quantity. This means that when a particle decays, it cannot transform into a heavier particle because more mass means more energy. It can, however, transform into one or more lighter particles because they can carry away the energy difference as kinetic energy (motion). To see how these conservation laws constrain the ways in which a particle may decay, consider the decay of a muon. The total charge before and after the decay is negative one (-1). The lepton number and muon number before and after decay are both positive one (+1). The electron number before the decay is zero (0), and this is the total electron number afterward because the electron’s positive one (+1) cancels the antielectron neutrino’s negative one (-1). Spin is also conserved because if the neutrino is spin up (+1/2), then the antineutrino will be spin down (-1/2), and vice versa. Including the electron, the total spin remains +1/2. We can see why the electron must be stable. There is no known lighter charged particle; thus, any decay would violate the laws of either conservation of charge or conservation of energy. From these patterns, we begin to perceive the awesome intelligence of the mind of God and the consistent way He upholds what He has made, from the largest galaxies to the smallest particles (Hebrews 1:3). Williams, W. S. C. 1991. Nuclear and Particle Physics. Oxford, UK: Clarendon Press, 329-333. Elert, G. The Standard Model. The Physics Hypertextbook. Posted on physics.info. In fact, all particles have a wave nature. But the wavelength is inversely proportional to the momentum of the particle. Hence, heavier particles have a shorter wavelength than lighter ones. By the time we reach the size and mass of an atom, the wavelength is generally much smaller than the particle itself and so the wave effects are not noticeable. In cases where the number of electrons is less or more than the number of protons, the atom is called an ion. This number represents the smallest observable electrical charge. The negative value means that electrons have the same charge sign as the negative terminal of a battery. There is evidence of “oscillations” in neutrinos—meaning they can actually change flavors. However, they remain neutrinos. Strange as it may seem, particles with 1/2 spin will either be measured to be spin up or spin down. Anything in between is not allowed. This is just another strange consequence of the world of quantum physics. The lepton number is a “bookkeeping” measure that you can think of as the amount of “leptonness” a particle possesses. Some theoretical models predict that lepton number is similarly only partially conserved. However, no violation of lepton conservation has yet been experimentally detected. Conservation Laws. Lecture notes for Physics 357 course, University of Toronto. Posted on physics.utoronto.ca. Image credit: Copyright © 1986 CERN. Adapted for use in accordance with federal copyright (fair use doctrine) law. Usage by ICR does not imply endorsement of copyright holder. * Dr. Lisle is Director of Physical Sciences and Dr. Cupps is Research Associate at the Institute for Creation Research. Dr. Lisle received his Ph.D. in astrophysics from the University of Colorado, and Dr. Cupps received his Ph.D. in nuclear physics at Indiana University-Bloomington. Cite this article: Various Authors. 2016. Subatomic Particles, Part 1: Leptons. Acts & Facts. 45 (7).